In the early stages of learning Spanish, although I don't recommend getting bogged down in grammar, there will come a time when you'll need to know specific grammar rules to progress in Spanish. If you've navigated to this article about direct object pronouns, you may be at that point already! 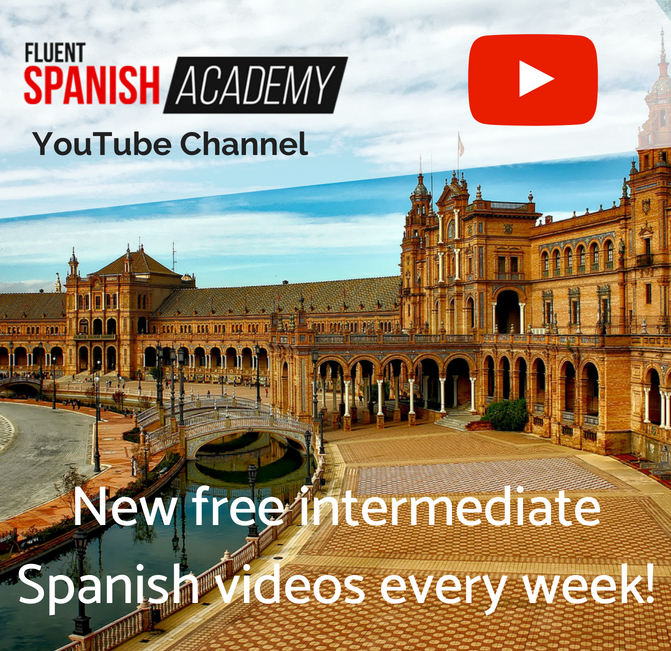 Learning the ins and outs of Spanish grammar, like how to use direct object pronouns, will be useful for you as your Spanish ability progresses from beginner to intermediate. 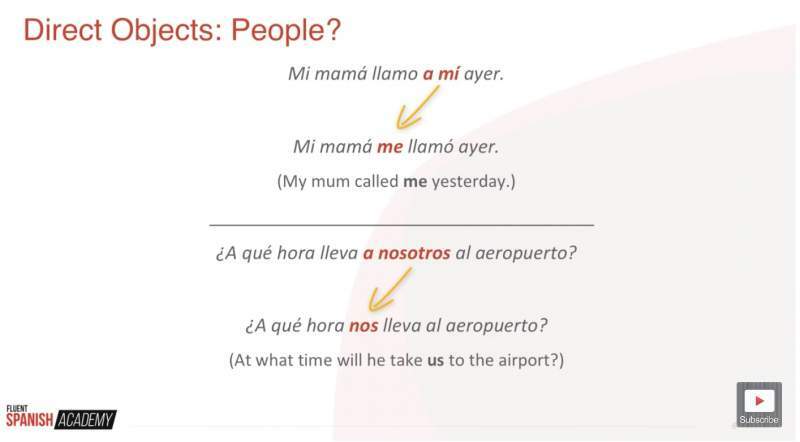 I'll start by explaining some grammar basics in English before moving on to ejemplos in Spanish to have you using direct object pronouns like a pro. Transitive verbs are verbs that need a direct object. One easy way to determine whether or not something is a transitive verb is to use it in a sentence by itself. “I poured” doesn't really make sense by itself. What did I pour? Ella tiene is also incomplete. What does she have? Each of these verbs, as well as all other transitive verbs, requires a direct object to complete a sentence or thought. The direct object is what answers the questions “what?” and “whom?” after each transitive verb. In the second sentence, the question is, “What did Luis kick?” Luis kicked the ball, so la pelota is the direct object. Whether the direct object is a thing, person, or noun phrase, it functions in the same way: receiving the action of the sentence's transitive verb. Don't let the grammar technicalities discourage you. You probably already know all about pronouns and antecedents…even if you don't realise it yet. That's because most people understand the specifics of grammar in their native language intuitively. You know what to say (or not to say) because it simply sounds right (or wrong). While you probably don't need to know the grammar terms to speak English correctly, it's not a bad idea to learn them in English before trying to learn them in Spanish. 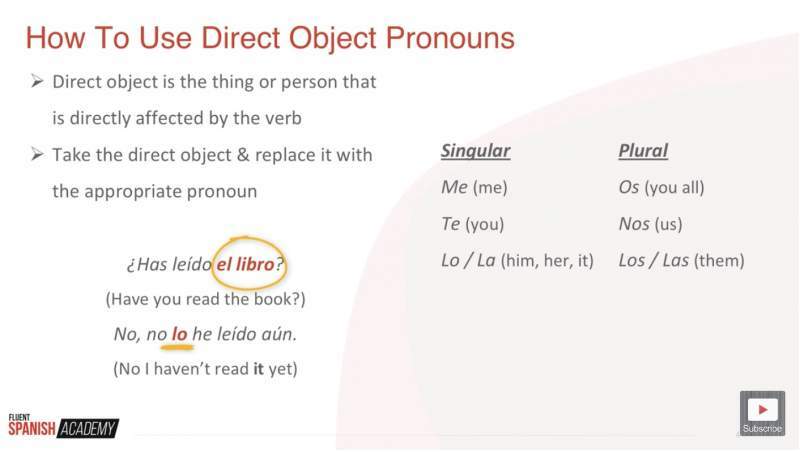 If your goal is to master direct object pronouns in Spanish, it will help to know what a pronoun and antecedent are before adding the extra complication of direct objects. Here are the basics, in case you're not familiar with them. Pronoun antecedents are nothing more than the words replaced by pronouns. In our earlier example, “he” is the pronoun and “John” is the antecedent. Even if you don't remember the actual term, you'll want to be able to confidently identify the antecedent so you can be sure you're using the correct direct object pronoun in complex sentences. Now that we've figured out all of the individual parts, it's time to jump in to direct object pronouns. 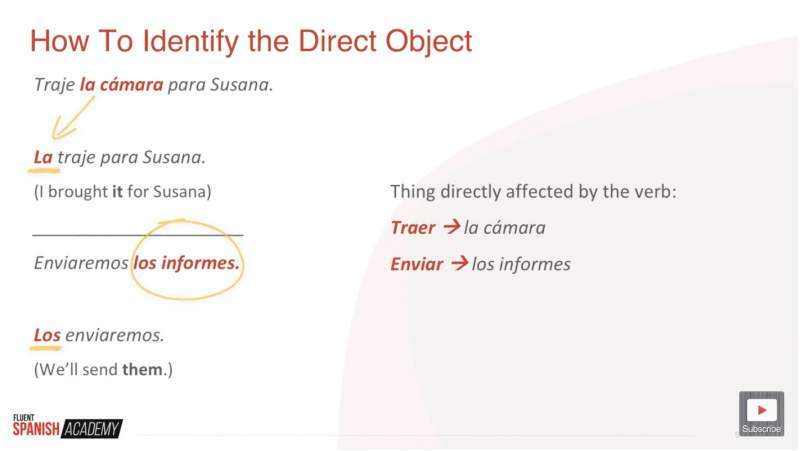 #3 What Are Spanish Direct Object Pronouns? 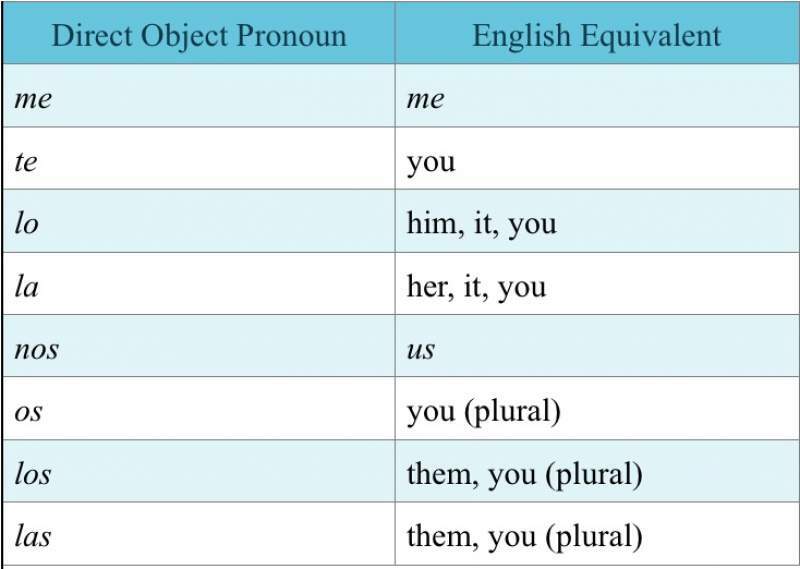 Direct object pronouns, in both English and Spanish, are pronouns that replace the direct object that accompanies a transitive verb. ¡Ojo! : The more complex the sentence, especially with multiple people, the easier it is to get confused when it comes to choosing the correct direct object pronoun to use. Remember that the antecedent is the person receiving the action, not the subject performing it. Direct object pronouns are fairly straightforward when the antecedent is a thing. Just be careful to match the gender of the antecedent when you select which direct object pronoun to use. If you find yourself getting lost trying to identify the antecedent in a long sentence, remember that the direct object pronoun will replace the entire noun phrase. 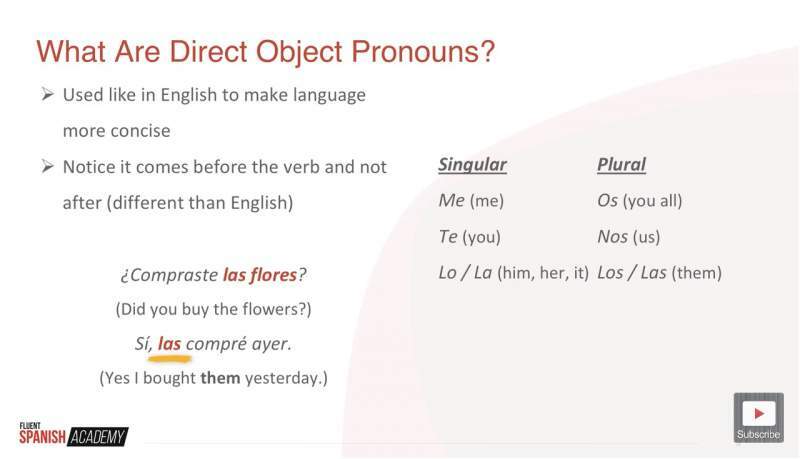 One aspect of using direct object pronouns that trips up some new Spanish learners is the pronoun placement, which is different from English. Maria and I rode the bus. / We rode the bus. Did you see James? / Did you see him? I threw the ball. / I threw it. Viste a James? / ¿Lo viste? Tiré la pelota. / La tiré. There are a few exceptions to this rule, however. You probably already know a few of them instinctively if you've been speaking Spanish for a while. In the case of the first three exceptions (infinitives, present participles, and affirmative commands), you can place the direct object either before or after the transitive verb. With negative commands, however, there is only one correct option. 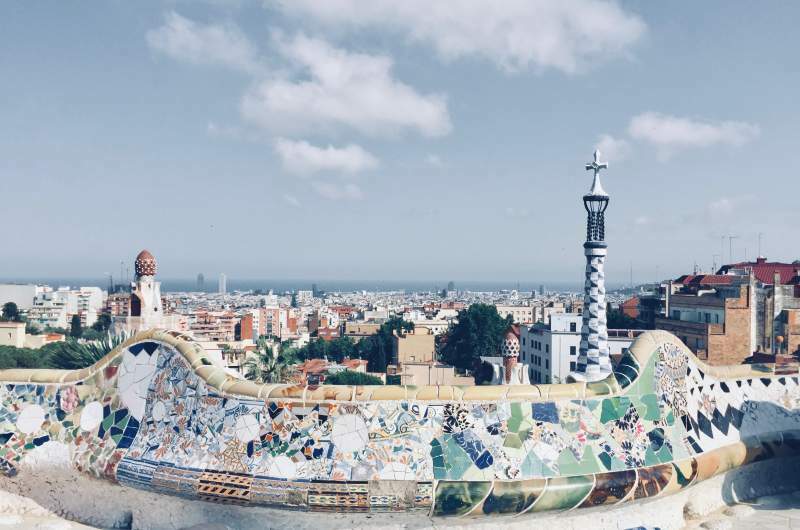 Like I mentioned at the beginning of the article, you're probably already comfortable using direct object pronouns in your everyday Spanish conversations. Even though you may not have realised it until now! Mastering the details of proper usage can be a benefit to you, however, as you start to construct increasingly more complex sentences. With a little revision and plenty of practice, you can feel confident using direct object pronouns and sound more like a native speaker. And be able to understand Spanish speakers better at the same time. 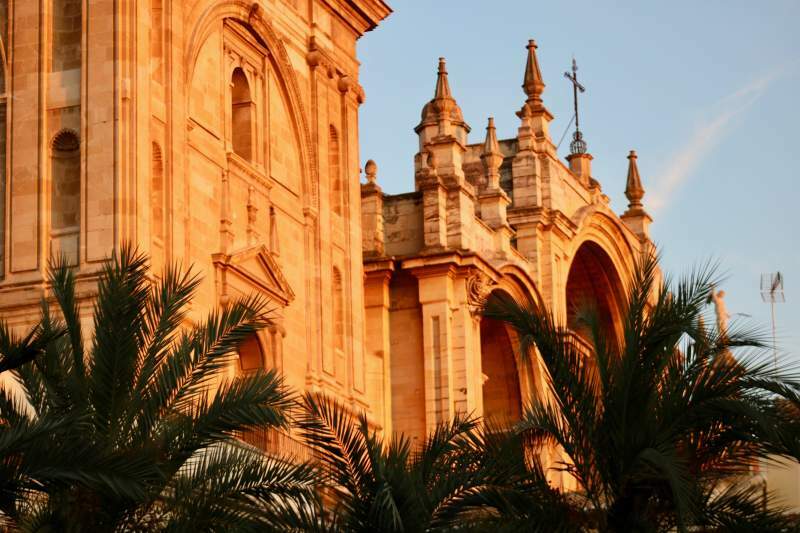 How are you feeling about Spanish direct object pronouns now you've read this post? Do you think you could use them comfortably in conversation? Share your thoughts in the comments below.